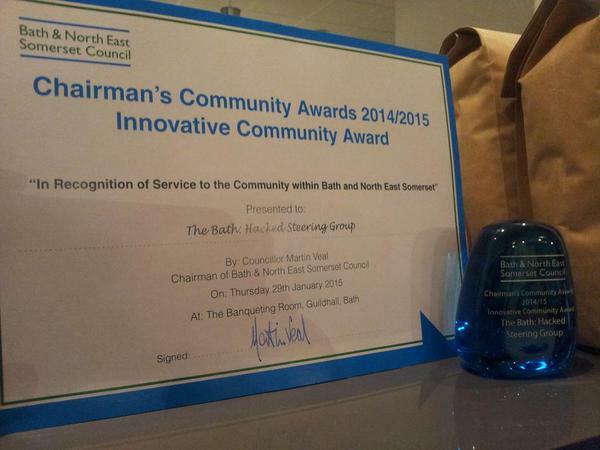 On Thursday 29 January Bath:Hacked was awarded an innovative community award by the Chairman of the Council and we’re very chuffed. To a lot of people “data” means little more than rows and columns of numbers and text; strange, impenetrable computer files that are an increasingly common part of everyday life. It takes a lot of work to make them relevant and interesting to people who aren’t paid to look at them for a living. In Bath and North East Somerset, a small number of residents took ownership of this issue and with the objective of “liberating Bath and North East Somerset Data to make interesting things” brought together a group of like-minded individuals and persuaded the Council to give up its data. This work has been driven by the energy and enthusiasm of the local population, and any community is defined by the sum of its parts; so far over 145 local residents (and a few council employees) have given up a huge amount of time to be involved. Working with data is at best a niche occupation, but this group has taken the idea of “doing good” and done so in a way that benefits the local area, its communities, businesses and the Council without seeking publicity or looking for glory; it would be great to say thanks! Huge thanks to everyone involved, it’s been an incredible team effort and we can’t wait to work with you all in the future!